In order to get to the lobby of the Astor Hotel in Astoria, you must pass through two sets of curtains in the foyer, each one blocking out more of the daylight that pours in through the glass front door. As you walk the foyer, its cinderblock walls painted black, the air becomes still and quiet like a crypt, belying what waits for you on the other side. The lobby is so dark that the only way to read the exhibition information about Avantika Bawa’s site-specific installation in Disjecta’s Portland2016 biennial is by the glow of your phone. The artist has covered the floor-to-ceiling windows in black plastic, in a way that calls to mind a condemned building. 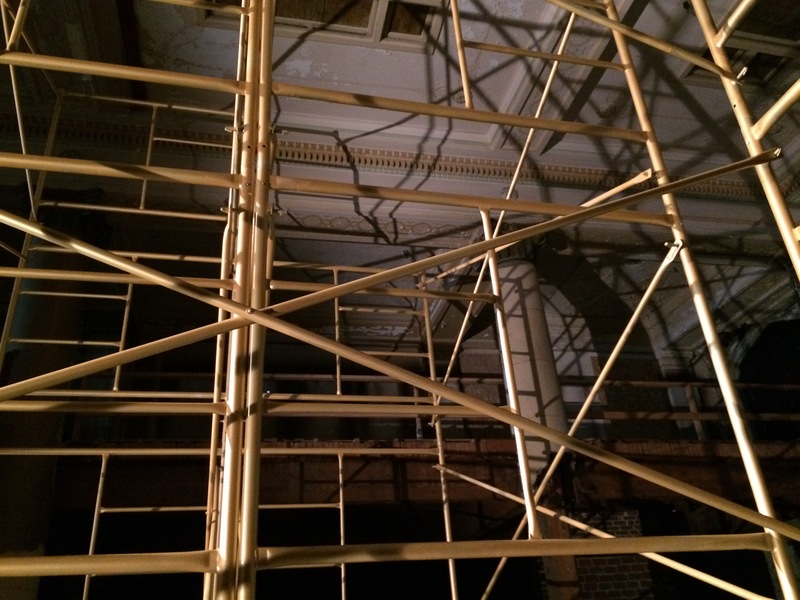 A handful of well-placed theatrical lights illuminate a golden scaffold in the middle of the cavernous space. The structure is probably 20-feet tall, but towering there, gleaming and alone, it feels twice as high. That is all you notice before the sound hits you. It starts off as an intermittent and faraway din—perhaps coming from outside?—and builds to an overwhelming clamor that you feel as much as you hear. Bawa made the recording while the scaffold was being erected, so the audio reflects the noise of construction: the clanging of hammers, the stomping of men in work boots, the reverberation of metal on metal. But it does not sound like a recording. The audio design is so remarkable that you will be convinced that there is a building crew above you in the lobby balcony. Even if you are completely alone in the space, you will not be able to shake the disquieting violent presence that isn’t there. The narrow beams of the two uplights cast long raking shadows across the ceiling. 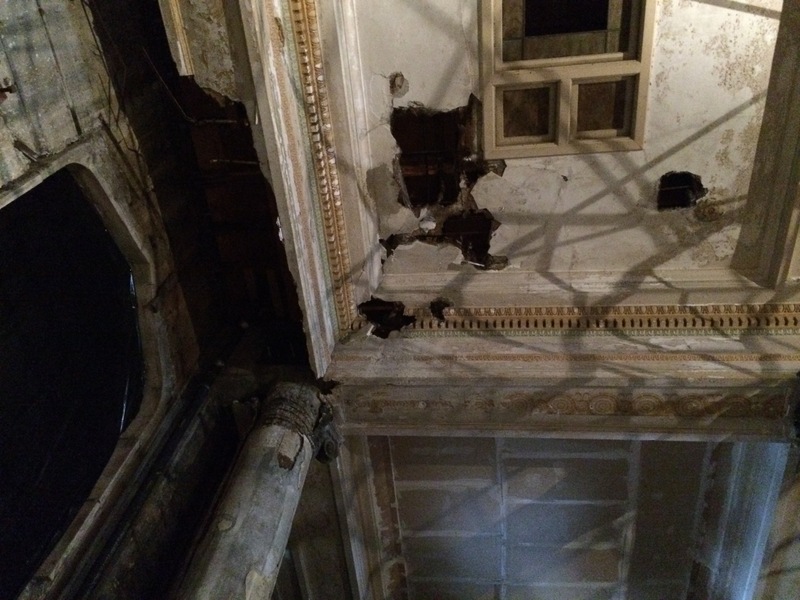 The diagonal, vertical, and horizontal lines of the scaffolding break into a ghostly web when they hit the highly ornamented crown molding. Holes in the ceiling so gaping as to expose the rafters are even more heartbreaking given their close proximity to the room’s stained glass skylights. Vestiges of the hotel’s former glory are evident throughout the space, from the enormous brick fireplace to the spectacularly patterned hexagon-tile hearth that surrounds it. 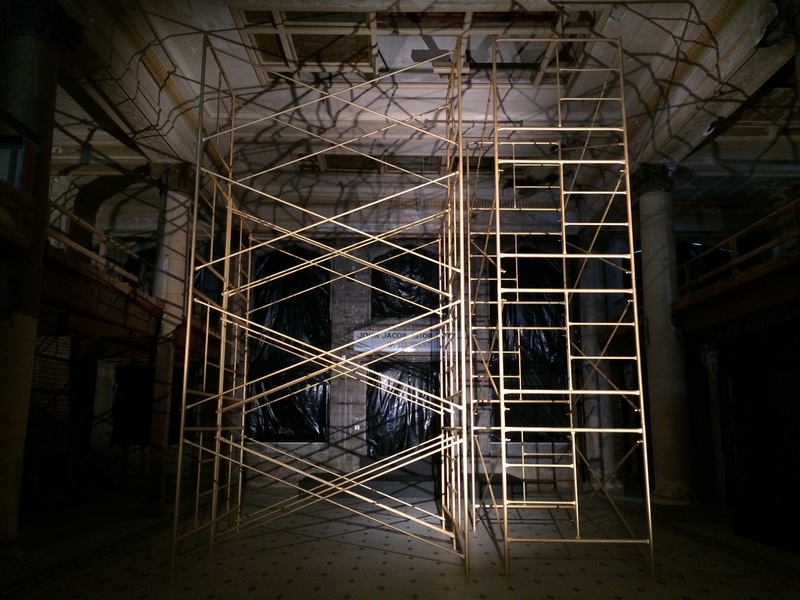 Without offering details, Bawa’s installation conveys the entire arc of the building, from its inception during the Gilded Age to its current state of urban decay. Everything about Bawa’s concept explores the contradictions inherent in the hotel’s story (or in the rise and fall of any once-great thing): light and shadow, silence and noise, presence and absence, grandeur and disintegration—even the construction soundtrack could be mistaken for one of destruction. A site-specific installation can be successful if the artist takes into account the feeling, size, and shape of the venue. Bawa, like her Biennial counterpart Heidi Schwegler, does one better by tapping into the cellular memory of place, by giving form to its DNA. And in Bawa’s case, she does so with minimal intervention. It is easy to dismiss successful minimalism because it seems so simple. In fact, there is less room for error in minimalist work because there is nothing to disguise missteps. In this case, were the lighting or audio design off by even a degree, the installation would fail spectacularly, coming off like a cheap haunted house. Bawa’s handling of sculptural, lighting, and sound elements with such precision and restraint is nothing short of virtuosic. Together, Bawa’s and Schwegler’s site-specific works serve as a reminder of the evanescence of all things. Grand hotels with gilded moldings decay, just as hardware stores with pea green carpets do. And we are not unlike these places: coming into the world, serving our purpose, and then fading away. The artist’s reception for the installation will be 6-9 pm Saturday, August 13, at the Astor Hotel, 1423 Commercial St., Astoria. Avantika’s work for the biennial can also be seen 12-5 pm Wednesday-Saturdays at Art Center East, 1006 Penn Ave., La Grande, Oregon.